Ashley M. Bickel - Gonser and Gonser, P.A. Ashley M. Bickel graduated from the Johns Hopkins University with a Bachelor of Arts in Writing Seminars and English and from Duke University, School of Law. She is admitted to the Bar of the State of Maryland and the State of Delaware. Ms. Bickel served as a judicial clerk for the Family Court of Sussex County for two years before going into private practice. Ms. Bickel currently practices in the areas of family law (divorce, custody, child support, adoption, Protection from Abuse hearings, guardianships), and special education law (IEP hearings, school board proceedings). 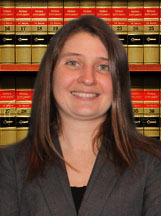 Ms. Bickel currently also handles dependency/neglect cases in the Family Court of Sussex County. She has been admitted to practice before all courts of the State of Delaware, the United States District for the District of Delaware, and all court of the State of Maryland. Ms. Bickel belongs to the American Bar Association, the Maryland Bar Association, the Sussex County Bar Association and the Terry Carey American Inns of Court. Copyright © 2016 Gonser and Gonser, P.A.